I got a request to make a stat breakdown about circus gear similar to the one I made for underground. They each have their own fixed white stats depending on the weapon type, their level and enchantment values. All 1h and 2h melee weapons, regular shields, bows and xbows are considered melee in the table. Staffs and magewals are considered mage. 1: random dura type that is similar to a MC weapon*. This comes in 3 tiers and does not affect the enchantment bonus. 2: random amount of patk for melee weapons. 3: random amount of matk for mage weapons, mage walls, maces and dirks. 4: random offensive stat inc based on the type of weapon. This either adds a melee** or a mage*** stat. 5: ​chance on a defensive stat. For melee this is evasion or def and for mage this is mres or mdef. 6: chance on either max hp, max mp, mp recovery, hp recovery or crit rate. 7: random increase of block def or perfect block for shields only. 8. random amount of crit power. So it is impossible to get a mace with macc. You also can't get a 2h staff with int % or an agi + dex % bow that adds to eva, acc and attack speed. ** for melee weapons and shields: pignore, ppierce, acc, att speed. *** for mage weapons and magewals: mignore, mpierce, macc, cast speed. It took many hours, but with Athyra's help I was able to make a list of the possible values. Thanks for helping out! The shield has d3 1h axe dura which is one of the options for 1h weapons and shields. This always adds 6% crit rate, 30 str and 3.6 att speed. The other stats are random ones that use ranges. I didn't update the ranges and it is possible to have a weapon with a slightly higher or lower bonus, but I have not seen any circus or Island weapons that do not use this system. Sometimes the melee weapons roll with str/int/wis/agi/vit/dex increase as a primary stat. I didn't know about the shield but maces and axes can get str, crit rate and attack speed as a main stat. Hi, firs of all thanks for your work! Second, are there been some update on the possible stat? because im looking for a good mace/shield (for my templar) and someone has stat that are not in the table, for example i have a shield with Crit % +6 ; Str +30 ; Atk spd +3.6 ; Atk + 697 ; Atk spd +2.8 (again!!) %block perf +2.3 ; Crit pow + 16.3 . Why two atk spd? and str +30? same for othere equip (like maces), sometimes they have strange stat. After spending hours of entering data it became clear that all of the circus weapons can be easily grouped together. I added a table to the first post and would not have taken this huge project on if it was not for Athyra and his help in collecting data. I hope it will be very useful. what are the ranges of the random stats 1h/2h can get? For one it mentions all available dura incs per item. But more importantly, it makes clear that some special options and combinations of them are impossible to get. Did you check the spreadsheet as well? The information about necklaces, rings and earrings is correct with the addition that you can only have one of the mob / player types. 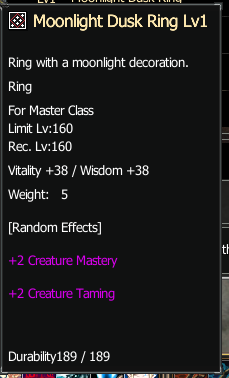 For rings you can also get creature mastery as a main option. It is possible to get a ring with 2 incs to it. I didn't really want to go in to those before double checking the ones I had. This ring disagrees with the last part of that list though. the spreadsheet is very accurate!